Add a dash of color and style to your day, with Verbatim's Color Nano Wireless Mouse. 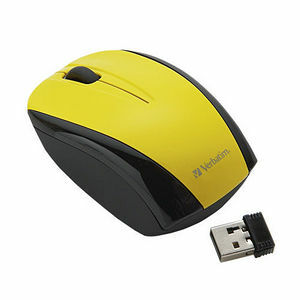 In six new colors, this mouse travels well in tight spaces. With a receiver that's small enough to plug into your laptop and leave, it offers 2.4 GHz wireless performance - that means no delays in cursor movements and fewer cords to pack. The receiver also slides right into the bottom of the mouse for safekeeping. Its sleek design offers a smooth, contoured comfort grip for right or left hand and a programmable roller button - that means, you can assign your favorite features to the roller and make your work easier. Small enough to fit easily in work totes, backpacks or even handbags, Verbatim's Color Nano Notebook Mouse offers cool colors to match your laptop, your bag or even your mood.